… and that may be why Kim Jong-un suspended tests. 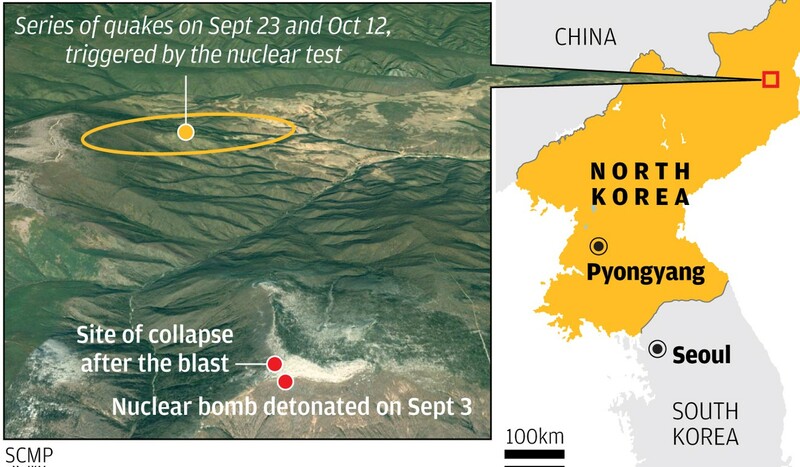 North Korea's mountain nuclear test site has collapsed, putting China and other nearby nations at unprecedented risk of radioactive exposure, two separate groups of Chinese scientists studying the issue have confirmed. The collapse after five nuclear blasts may be why North Korean leader Kim Jong-un declared on Friday that he would freeze the hermit state's nuclear and missile tests and shut down the site, one researcher said. The last five of Pyongyang's six nuclear tests have all been carried out under Mount Mantap at the Punggye-ri nuclear test site in North Korea's northwest…." So are they going to ask the outside world now for tons and tons of money now … to fix the radioactive hole(s) they created in the process of trying to bring death to that same outside world? I agree, North Koreans entirely brought this situation upon themselves. When we all become friends of course, they will be asking the world for aid to feed the poor starving people. Kim has decreed that the mountain shall be renamed the Kim Jong-un Valley Of Peace. Thankfully, the occupants of nearby heavily guarded "education resorts" have been clamoring for the chance to be the first "volunteers" to do "landscaping" at the site. Trainloads of these workers have been photographed laboring with radiant smiles and glowing enthusiasm. Fearful that outsider running dogs may try to interfere with progress, the site has been surrounded by all available anti-aircraft guns to "protect" them as they go about their duties. It was also reported in Russia some time ago – we're quite close to the site to look at NK very carefully. Experts think that the explosion, that NK has named as H-bomb test was the last drop before the cracks appeared and some tunnels collapsed. We have Vladivostok in potential danger zone. One of the experts also pointed that for NK it might be cheaper to abandon nuclear status and get the world help than to build a new test site…even if they can isolate and decontaminate an old one. Anyone else notice the article says North Korea's northwest, but the location on the pictured map clearly shows the northeast. If they can't get the little details right, it makes me wonder about the accuracy of the rest. The "news" of the collapse is not new. There were reports shortly after the H-Bomb test that there were some tunnel collapses within the mountain and that the mountain itself was expected to collapse. Nah, they're just trying to kill the Balrog!! But NK is on the other side of the world, so they had to flip the map over, that flips the east and west sides. Yeah, I'm pretty sure that's how it works. USAPilot: "Anyone else notice the article says North Korea's northwest, but the location on the pictured map clearly shows the northeast"
Their poor starving people do need our help. What has happened to them is not their fault. But what happened last time with all the humanitarian aid that was sent to them? Once it got there, didn't Lil Kim have it sold and converted into cash and materials to build up his nuclear program?